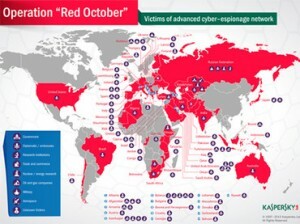 Kaspersky Lab has uncovered Operation Red October, (Rocra) a 5 year scheme by the Chinese and Russians to steal diplomatic, industrial and scientific data from Eastern Europe, North America and Asian organizations. Beginning in 2007, intelligence gathering operations were conducted in the form of attacks by cyber criminals toward Western nations. The thought is that this is in retribution on behalf of Iran for the damage caused to their country. Rocra appears to have been controlled by 60 command-and-control servers that were held in Germany and Russia. It is suspected that there is another “mother ship” server based in an unknown location. The software is broken down to continually run within the system until triggered to activate. Examples are stealing information from a connection made by a mobile phone or syphoning mail servers and downloading emails. Although Kaspersky Lab admits that these attacks have not definitively been connected to China or Russia, it is assumed that the data collected would be yield a high price on the black market. Rocra is able map out the internal layout of a network and information routes taken by computer software to take files with the use of thumb drives and smartphones. In 2012, the US House Intelligence Committee (USHIC) warned American corporations in a new report against conducting business with 2 Chinese firms because of national security threats. Both Huawei Technologies and ZTE, two of the world’s largest telecommunications corporations and suppliers of cellular phones and technology are being highlighted by the US government and blamed for cyber-attacks. It is also claimed by the USHIC that they are involved in digital espionage. It is claimed that former industry insiders provided intelligence to the US concerning Huawei’s violations of US laws such as immigration, bribery and corruption as well as an alleged “pattern and practice” using pirated software in its US satellites. The report stated that the Chinese corporations were employing intelligence sources as well as private sector companies and other unnamed entities that could and assumedly did steal trade secrets, sensitive information and prehistory data while simultaneously shipped infected hard ware and software to the US with the intent to cause disruptions in national security during war time. Around the same time as the release of the report, an anonymous White House official said there was an attempt to hack into the executive branch’s computer system through an unclassified network. No data were removed, proving that this was not an actual hack. The nameless official said that the experiment was a “spear-phishing”. In January, analysts at the Council on Foreign Relations (CFR) have confirmed that hackers traced to China attacked their system. The “drive-by” hacking utilized a pirated computer. To compound the problem, the analysts said that the hackers removed their malware and traces of their presence from CFR computer systems. Recognizing China as becoming a formidable replacement to the US as the world’s super power, the CFR has outlined specific responses to this crisis of supremacy. Citing Chinese internet policy, their disdain for freedom of speech in social media, and influence in global cyberspace, the CFR appreciates that this rising “foe” must be confronted indirectly with propaganda to distract from the obvious. This attack marked a new level of attack by international hackers who aim to steal information from government websites and computers. The “drive-by” tactic covertly plants malware, then the website itself is used to attack visitors to the site. Visitors can be infected as hackers will them attempt to hack into other computers as visitors are passing by. The hackers use the main site as a “watering hole” that attacks users to it for the hackers to steal information from their computers.